Edgar Degas, Little Dancer, Aged Fourteen, 1880. Bronze, h. 99.1 cm. Private Collection. TEL AVIV.- Previously deemed a sentimentalist, mostly immersed in the world of dance and the stage, Edgar Degas (1834-1917), one of the foremost artists active in Paris in the late 19th century, has recently been rediscovered as an artist of unusual intellectual power. His profound interest in capturing the "spirit of the time" while meticulously scrutinizing the everydayconcurrent with confrontation of the lessons learned from the great masters of the pastenabled him to formulate trailblazing insights pertaining to the visual arts as well as to the social and gender orders of the time. Degas employed a wide range of techniques: he drew, painted in oil and pastel, experimented with etching and monotype, sculpted in wax, photographed, and even wrote sonnets. His entire oeuvre attests to the close affinity between his two- and three-dimensional work, indicating to what extent his sculpture complemented and enriched his painting, just as much as his painting made possible, perhaps even demanded, the sculptural practice. The exhibition focuses on Degas' sculpture. It presents all of his 74 known bronzes in a new edition, whose casting was made possible following the recent discovery (in 2004) of plasters made by Degas' close friend, sculptor Paul-Albert Bartholomé, from the artist's original wax sculptures, with his knowledge and consent. Degas' body of sculptural work is divided into thematic units here, focusing on major themes in his oeuvre: dancers performing on stage, dancers backstage, women, bathers, horses and riders, and heads. 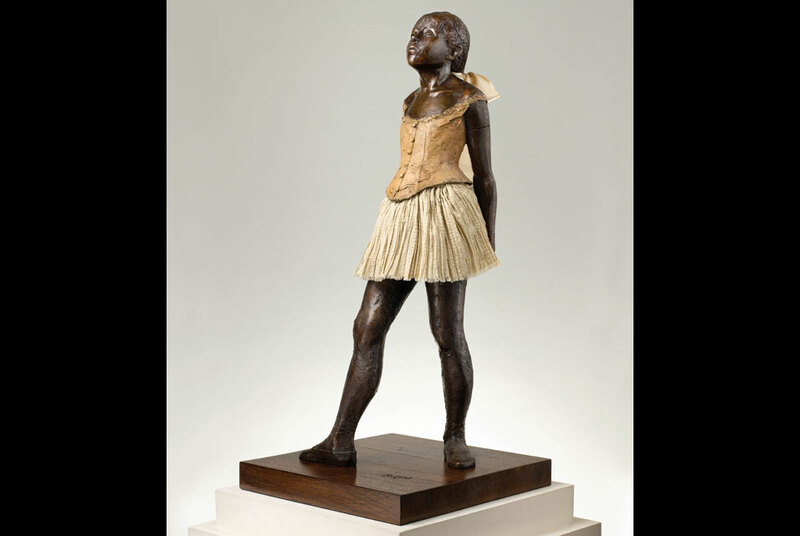 All the sculptures are courtesy of the Degas Sculpture Project Ltd., excluding The Little Dancer, Aged Fourteen (private collection); the curators of the Degas Sculpture Project Ltd. are Walter F. Maibaum and Carol Conn.